Harold Hector Whitlock was born on 16th December 1903. He lived at Shardeloes Road, New Cross and was an automechanic. 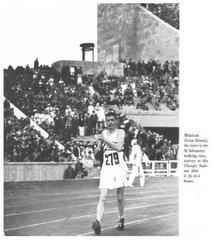 He won gold in the 50km men's walking race at the 1936 Berlin Olympics, and held the world record for the 50km. In 1952 he came out of retirement to compete in the 1952 Helsinki Olympics, where he carried the Great Britain flag at the opening ceremony. He came 11th at the age of 48. He died on 27th December 1985.